As usual now for my papers, this is open access and freely available to the world. 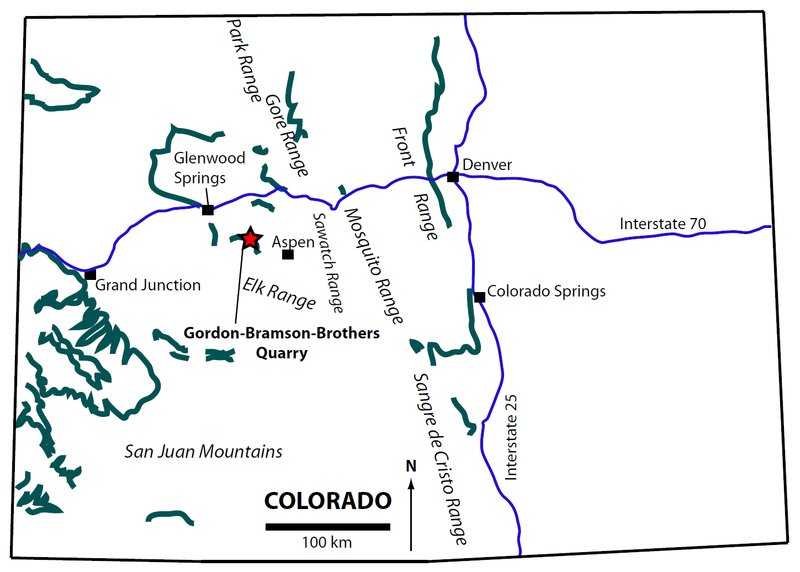 Thick line indicates outcrops of the Morrison Formation; quarry indicated by star. A. Quarry map showing association of anterior caudal and posterior dorsal vertebrae around the sacrum. 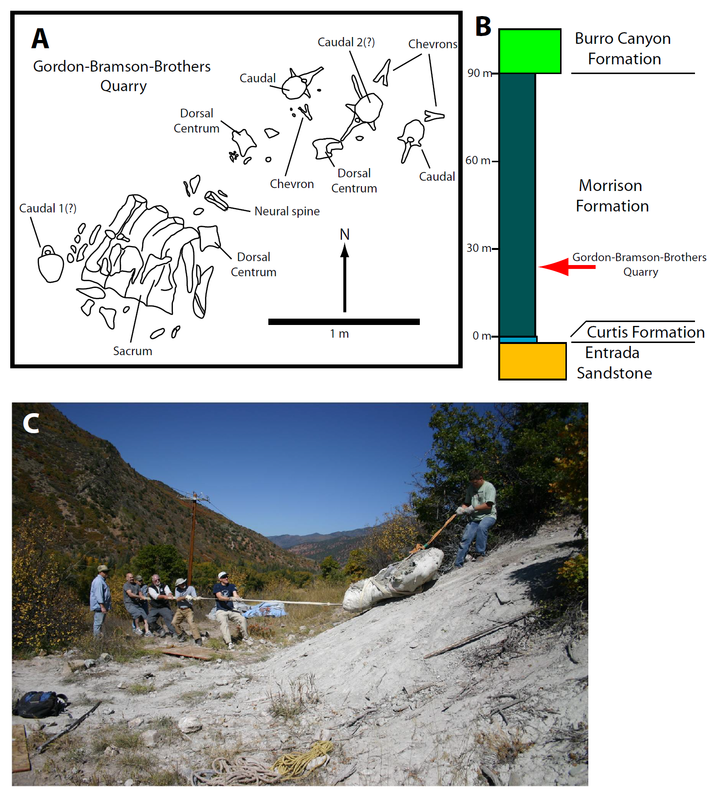 B. Stratigraphic section showing position of the quarry within the Morrison Formation. C. Dragging field jacket containing the sacrum, one caudal, and two dorsal centra in September 2009. View looking north. Fig. 3. MWC 8028, Haplocanthosaurus dorsal vertebrae. A. Lateral view of dorsal centrum with bottom edge of lateral pneumatic fossa preserved. B. Dorsal view of same centrum as in A, showing the median septum between the paired lateral fossae. C. Lateral view of dorsal centrum with smaller segment of the lateral pneumatic fossa margin preserved. D. Dorsal view of same centrum as in C, again showing the median septum and paired lateral fossae. E. Lateral view of dorsal centrum with partial pleurocoel preserved. F. Cross-sectional (posterior) view of same dorsal as in E. G. Dorsal neural spines in lateral (top) and anterior or posterior (center, bottom) views. Scale bars = 10 cm. A. MWC 8028, sacrum in right lateral view. B. MWC 8028, close-up of S4 and S5 centra highlighting pneumatic fossae. 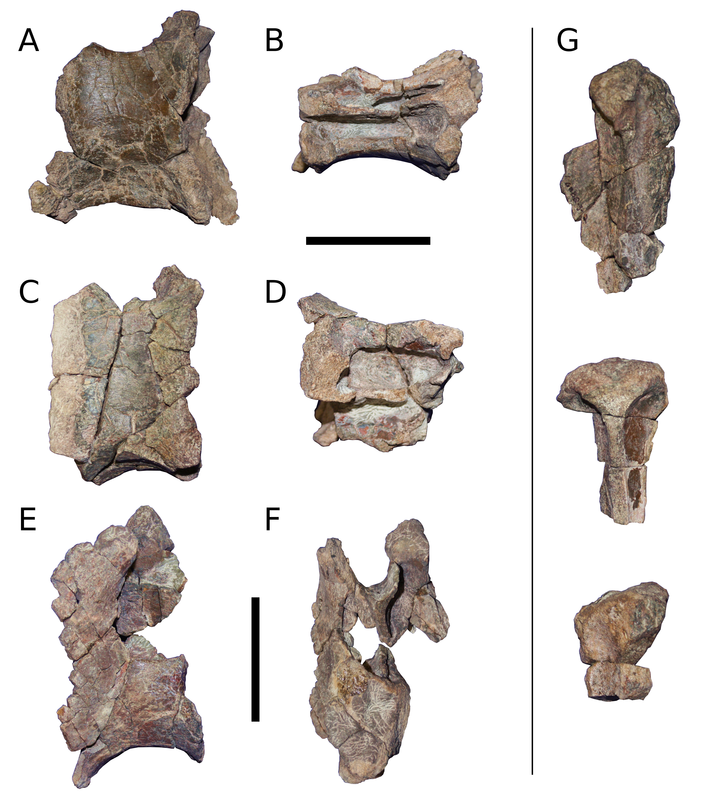 C. MWC 8028 with divisions between the vertebrae overlaid. D. CM 879, sacrum in right lateral view with divisions between the vertebrae overlaid. E. CM 572 in right lateral view, after Hatcher (1903c: plate 4). B–E are not shown at the same scale, scale bar for A = 20 cm. 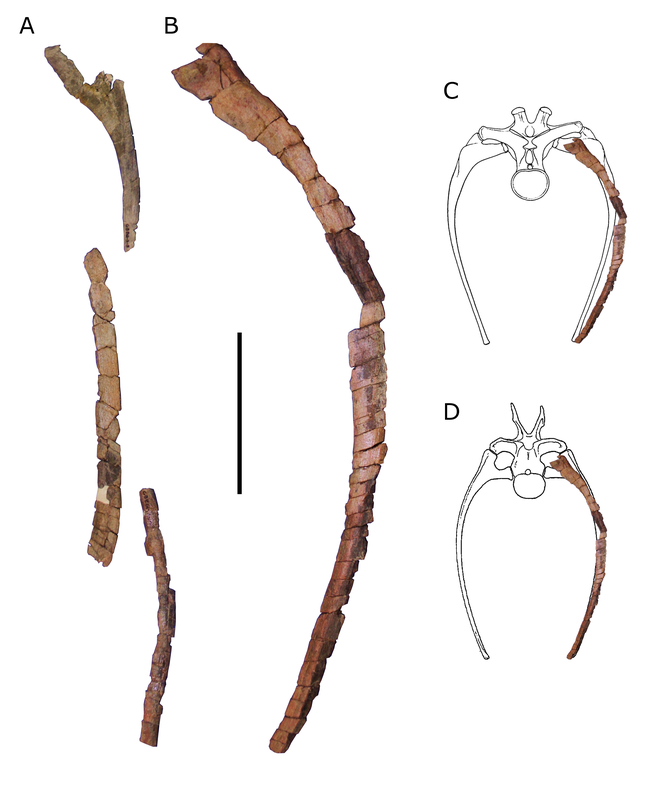 Note that the neural arches in CM 572 were restored during preparation, and the sacral neural spines as shown here are probably lower than they would have been in life. A. Caudal 1(?) in anterior view. B. Caudal 1(?) in posterior view. C. Caudal 1(?) in right lateral view. D. Caudal 1(? ), close-up of neural canal in posterior view with the ventral excavation highlighted by the arrow. E. Caudal 2(?) in anterior view. F. Caudal 2(?) in posterior view. G. Caudal 2(?) in left lateral view. H. Caudal 2(? ), close-up of neural canal in posterior view with the ventral excavation highlighted by the arrow. I. Caudal 3 or 4 in anterior view. J. Caudal 4 or 5 in anterior view. K. Caudal 4 or 5 in posterior view. L. Chevron in posterodorsal view. Scale bars = 10 cm. A. Fragments of posterior ribs; the three pieces shown here do not belong to the same rib. B. The most complete posterior rib. 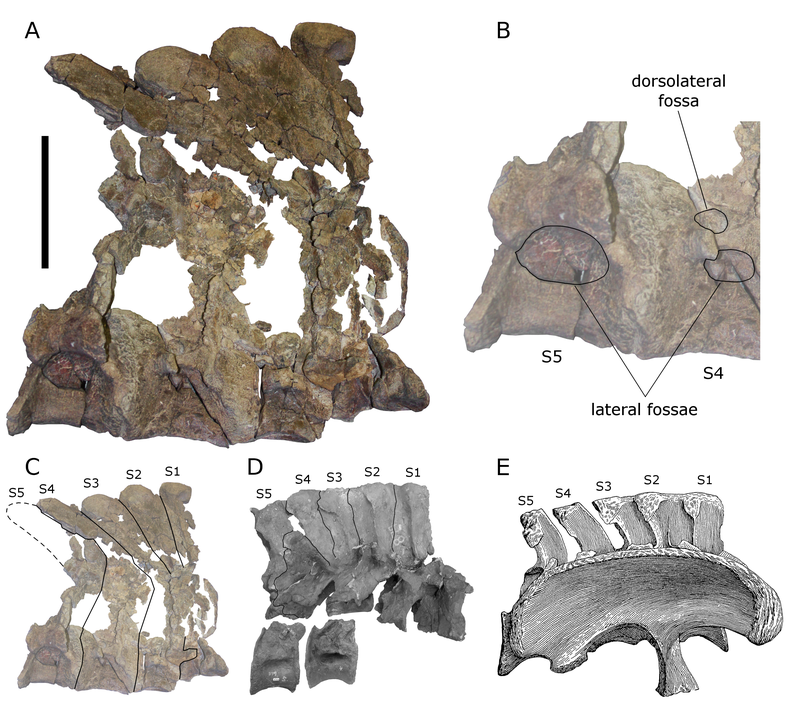 C. Cross-section of Camarasaurus torso at the fourth dorsal vertebra (after Osborn, Mook, 1921: fig. 72), with the rib from B overlaid. D. Cross-section of Diplodocus torso at the seventh dorsal vertebra (after Holland, 1910: fig. 17), with the rib from B overlaid. Scale bar = 20 cm. 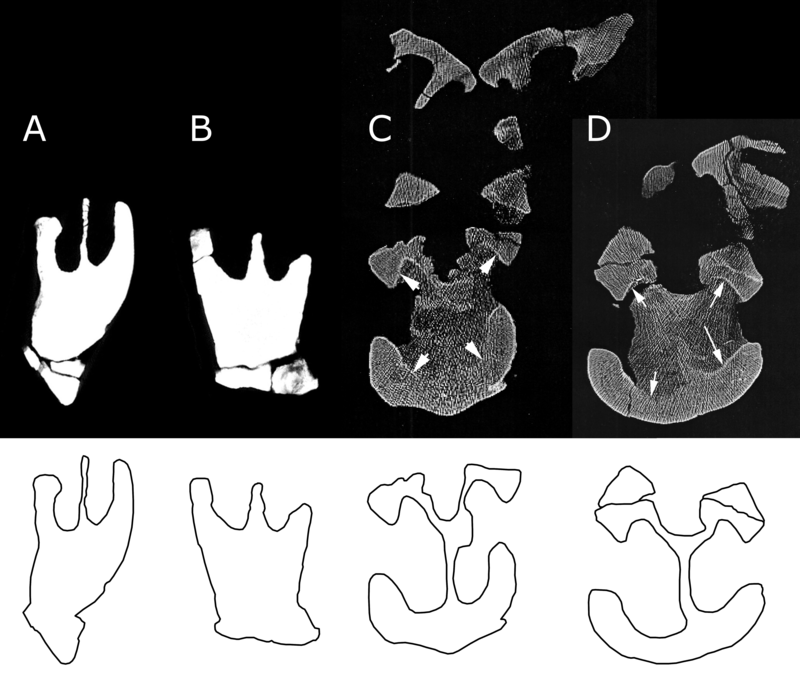 Interpretive outlines of bone in each centrum below the CT scans. Dorsal centum diameters in all four vertebrae are approximately 15–16 cm. Note procamerate condition of centra in A and B; lower halves of the centra are solid and fossae are shallow. In C and D, the centra are camerate and the arrows point to the contact between the lower and upper edges of the camerae and the infilling matrix. 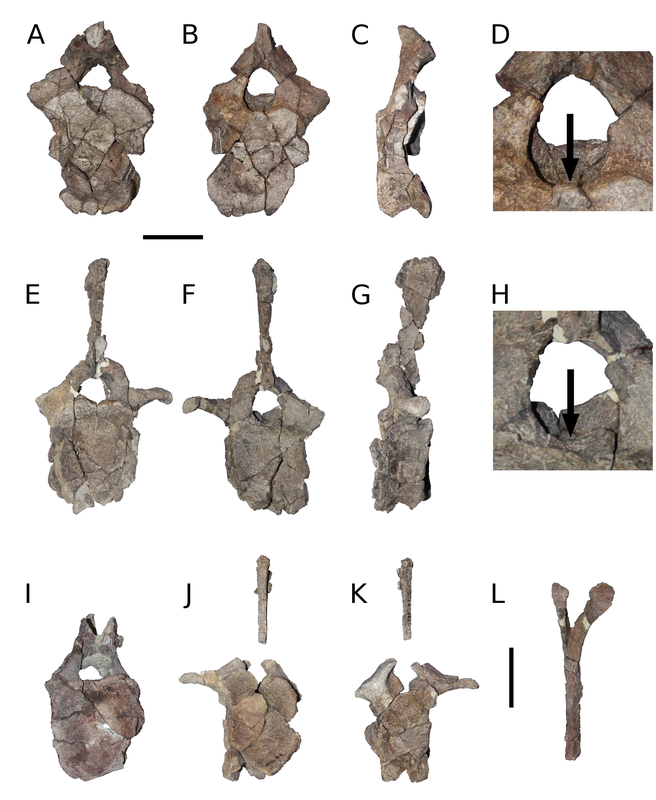 These images contrast the much more pneumatic condition of the dorsal centra of even a juvenile Camarasaurus (C and D) with the more solid construction of the centra of MWC 8028. In CM 572 (H. priscus), the ventral half of each dorsal centrum is solid, as in MWC 8028 (Wedel, 2003, fig. 8; Wedel, 2009, fig. 6).